What A/B Testing solution do you use? 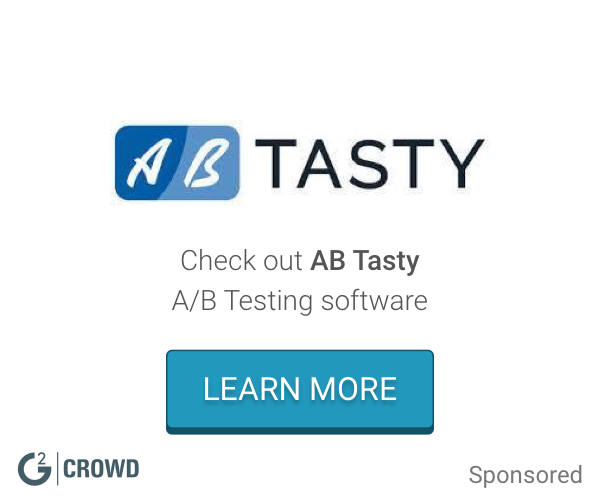 VWO is an easy A/B testing tool. Tweak, optimize & personalize your website and apps with minimal IT help. The most affordable and fastest enterprise a/b testing and personalization solution for CRO & data-driven decisions in high-traffic websites. Target makes it easy for you to create personalized digital experiences that deliver real results and revenue. SiteSpect's solutions include A/B testing, multivariate testing, behavioral targeting and personalization, landing page optimization, mobile web and app optimization, front-end optimization, and back-end testing. Google Optimize offers AB testing, website testing and personalization tools for small and large enterprises to help deliver engaging customer experiences. Oracle Maxymiser enables the optimization of customer experiences with data science technologies covering multivariate testing, audience-segment discovery, and predictive personalization. Watson Real-Time Personalization helps digital marketers improve customer experience and makes personalization easier by learning through each interaction and delivering the right content to each visitor in the context of their previous interactions with the brand. SiteGainer is a next generation A/B testing and conversion optimization platform. * We monitor all ChangeAgain reviews to prevent fraudulent reviews and keep review quality high. We do not post reviews by company employees or direct competitors. Validated reviews require the user to submit a screenshot of the product containing their user ID, in order to verify a user is an actual user of the product. Hi there! Are you looking to implement a solution like ChangeAgain?